Aviation relies on a vast and complex network to dispatch airplanes, turn aircraft around at a local airport, guide flights across the sky and safely back to the ground, finance equipment and maintain the regulatory framework that keeps aviation and aerospace turning over. There are literally thousands of jobs for recruits who want to keep their feet on the ground, and those who want to work in the air in a different capacity – flight attendants. Careers in Aviation provides a sampling of some of these opportunities. Depending on the size of airplane, a team of up to 35 ramp attendants will offload an arriving flight and ready the airplane to receive a new load of passengers. An aircraft maintenance crew will marshal aircraft to and from the gate, manoeuvre the air bridge, operate a fleet of vehicles including tow trucks and catering trucks, attach nozzles to the aircraft to pump lavatory waste out, unload hundreds of passenger bags and tonnes of air freight, refuel and clean the cabin. There is more to the job than meets the eye. Each aircraft is different, and the weight of an aircraft changes daily. Airlines, third-party air service providers or airport authorities employ most ramp attendants. It is demanding physical work and airlines typically have standards on how much a candidate is able to lift on a regular basis. A flight dispatcher is like a ground captain, except where the captain is operating a single aircraft, an airline dispatcher can be responsible for up to 50 aircraft during a single shift, including charting routes and alternates, calculating fuel loads and aircraft weight, monitoring flights (known as “flight watch”) and making decisions whether to divert or cancel flights if an aircraft cannot continue to operate safely. A dispatcher is also plugged into air traffic control to ensure the most efficient routings and minimize costly air traffic control delays. An airline dispatcher makes joint decisions with the flight captain to ensure a safe and efficient flight, including giving the crew a situational update prior to departure, including aircraft activity and weather information and feeding data to the flight deck en route. A commercial pilot licence, flight services specialist experience, air traffic control experience or related experience within a flight operations centre can improve career prospects, especially with the larger air carriers. Before controlling, directing and advising aircraft in Canadian air space, air traffic controllers and flight service specialists go through intensive training programs that last anywhere between one- and two-and-a-half hours. The curriculum and duration of NAV CANADA’s training programs depend on the stream a student is selected for. All streams require focus, hard work and commitment. Training is delivered on a full-time basis. Class times vary by location, but they are typically eight hours a day. Students can also expect to put in additional study and simulator time to prepare for next day’s classes. Expect to invest a further two to three hours after class hours to succeed. The award-winning BCIT diploma program in Airport Operations is designed to meet the demands of today’s unique and dynamic global airport operation environment. The 16-month Airport Operations is supported and approved by the aviation industry and provides students with a comprehensive, interdisciplinary program of study. This is the only program of its type in Western Canada. 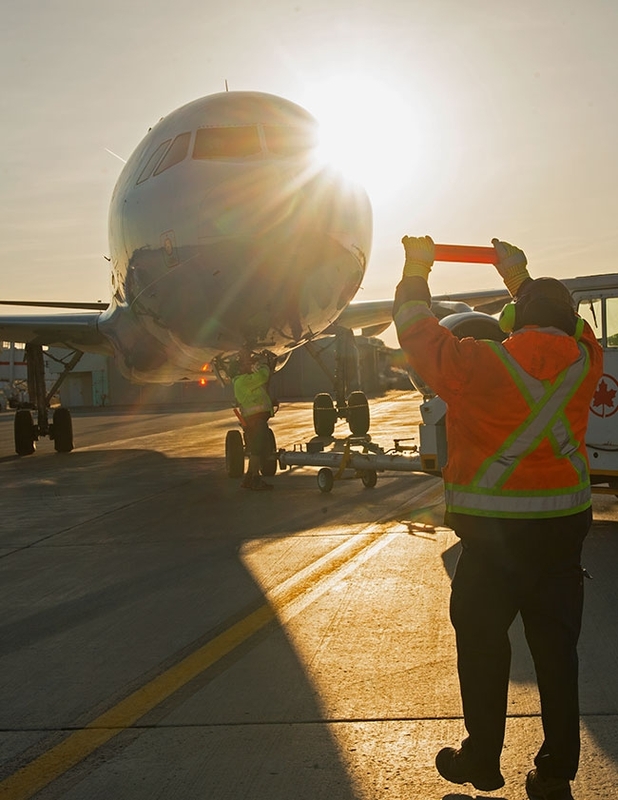 BCIT also offers an online Airport Operations Part-time studies Associate Certificate. Concordia’s John Molson School of Business offers non-credit courses in leadership development and aviation management to partners in the aviation industry. Concordia’s Aviation Management Institute (AMI) has partnerships with many universities and international organizations, and has developed blended learning programs for both the International Civil Aviation Organization and Airports Council International. AMI initiatives include on-line programs such as the AVSEC Security Professional Management Course and the Airport Executive Leadership Program, as well as organization-specific executive programs. These programs are offered at Concordia, international training centres or on-site at the client’s home offices. The Canadian Aviation Institute (CAvI) at Georgian College is a national centre of aviation management training and education. Graduates of CAvI work in a variety of aviation fields including airport management, aviation operations, airport planning and air traffic control. Commercial pilots, flight dispatch, flight services specialists and many other aviation-related occupations have benefited from this additional enhancement to their chosen career field. Located in Barrie, Ont., the three-year Aviation Management diploma program provides students with a solid understanding of the aviation industry. The Flight Services program encourages students to develop career-related skills, knowledge and behaviours to effectively perform a variety of functions required in providing exceptional passenger service. As a Flight Services graduate students may find employment as a passenger service representative, check-in agent or reservation agent. The Operations and Cabin Management diploma program encourages students to develop career-related skills, knowledge and behaviours to effectively perform a variety of functions required in providing passenger safety and customer service in the airline industry.